The Methodist Church in Poynton hosts Poynton Board Game Day every few months. Now in its second year, between 40 and 70 participants take part in a host of different (>100) tabletop games: some serious, others silly. Go, Chess, Mah-jong, Scrabble, Monopoly and Cluedo are all available, though excellent modern games are the most popular, including Captain Sonar, Dobble, Fluxx, Pandemic and Puerto Rico. Enjoy a full day of games, tea and cakes. Learn new games or bring your favourites. 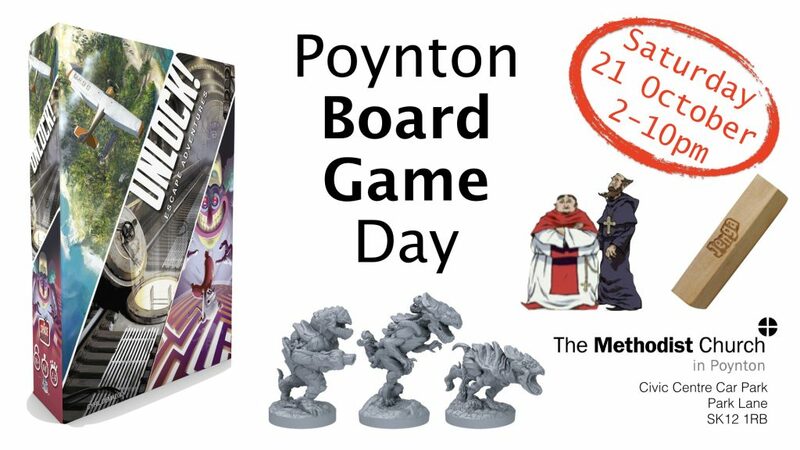 More information is available on Facebook.com/PoyntonBoardGameDay, and if you have any questions for the organisers, send them a message on Facebook.